Last night I posted a brief survey about what kind of articles you most enjoy on this blog, and had around 150 responses. I’m grateful for the feedback, and thought you might be interested in a summary of the results (the survey is still open, by the way - so do feel free to share your thoughts). The results for each question are presented as appropriate charts below, each of which links to the original chart image on Flickr accompanied by the raw data. If you can’t see the charts for any reason, the results are described in this article. Some people enjoy longer pieces, and some prefer much shorter, bite-sized reading material. I asked what length of article you tend to like most. 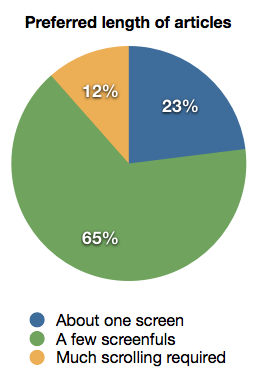 The majority (65%) prefer articles that are a few screenfuls long, or thereabouts. Not too short, but not enormous either. In second place (23%), short articles of about one screenful. I gave a list of topics I’ve commonly covered, allowing you to choose as many as you liked. Because of this, the percentages add up to more than 100%; they show the percentage of all respondents who chose each option. As expected, the most popular topics were user experience and user interface articles (86%), iOS and Mac pieces (84%), and developer-focused material (75%). 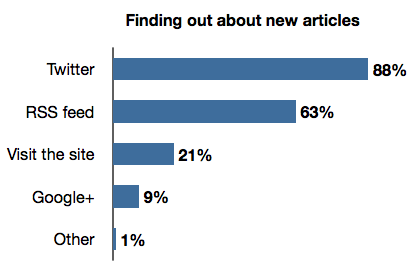 More than 60% of you also enjoy tech industry news, design articles, and personal pieces. The majority of those who chose the ‘Other’ option (14%) said that I should write about whatever I feel like, which is very encouraging. It’s always difficult to decide how often to publish a new piece, particularly if it’s a longer article. I asked how often you’d like to see new material. 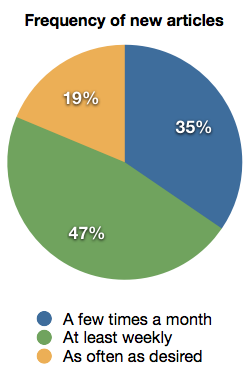 The most popular choice was to see a new post at least weekly (47%), followed by 35% who chose a few times a month. Only 19% would impose no limit at all. That pretty much fits with my current output, which is somewhere between daily and weekly, and closer to the latter on average. I was interested to know how you find out about new articles. Note that the survey was announced on Twitter, so the votes for that particular medium are likely to be somewhat skewed. I still get the feeling they’re roughly representative, though. As with the preferred topics question, this question allowed you to choose as many options as you liked, so the percentages will add up to more than 100%; they show the percentage of all respondents who chose each option. Those who follow me on Twitter came in first at 88%, followed by those who subscribe to this blog’s feed at 63%. A surprisingly high 21% just visit the site regularly to see if there’s new content, and only 9% keep up to date via Google+. As I’ve discussed at some length, I recently switched comments off for this blog. I asked how you felt about that. 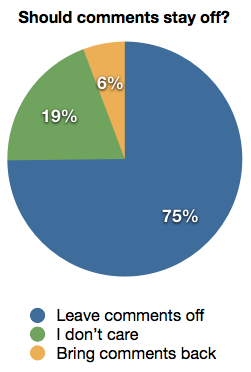 The vast majority (75%) agreed with the decision, saying that comments should remain off. 19% said they didn’t care either way, leaving only 6% who preferred that comments be reinstated (I don’t have any current plans to do that). There were also free-form questions about what you dislike most about the blog, what accessibility requirements I wasn’t meeting, and a field to enter any further thoughts. I’m glad to report that there isn’t anything you significantly dislike, nor any accessibility problems of particular note (though a handful of you would prefer that the text was a little smaller). The general feedback was very positive, and I’m extremely grateful for it - the most common theme was to keep doing what I’m doing, which I certainly plan to. Writing on this blog is one of the most personally fulfilling things that I do (right up there with fighting the good UX fight, and campaigning for accessible software), and I can’t adequately describe how pleased I am that other people take the time to read it. Following the encouraging recent traffic milestone, the blog seems to be going from strength to strength - visitor statistics since then show an even steeper increase - and I’m looking forward to continuing to share my thoughts with you here during 2012 and beyond. Thanks for reading.